A pair of romantic starfish at the beach sets the tone for your own tropical wedding or beach wedding! The colorful photograph forms the background for the entire wedding invitation. Choose two lettering styles and two imprint colors for your wording. Invitation includes inner and outer envelopes. Very good quality and great prices! The only thing I would change is they should have someone proof read the online orders. My daughter had spelled a word incorrectly, which was our fault, but if they had someone to verify orders, it would be helpful! Very pleased with the quality, printing and visualization. We used it as an announcement opposed to an invitation due to getting married on the Beach while out on a cruise. We didn't expect anyone to attend, but wanted to announce our event. We loved how easy the entire process was. We had a blast personalizing the invitations and was very pleased with the quick delivery! Great product! Overall good experience & happiness with order. We used these as our beach wedding invitations and the design fit perfectly with our theme. We absolutely loved the finished product, however we feel that if we owned a good home printer, that we would have been able to create and obtain the same quality that we received. But still, our invitations were done quickly and sent out immediately, saving us quite a bit of time as opposed to have doing them ourselves. So, you'll have to decide for yourself which is more important to you, your sanity or a couple of extra dollars. We opted for sanity and were very, very pleased with the product we received. Very happy with this product! I was a little worried because I ordered "save the date" under this same design and the print was in white so the writing does not pop out. I was very happy to see the print had color for the actual invitations. Shimmer paper makes it look great, quick delivery, perfect quality....awesome!! Customer Service was extremely helpful and these are beautiful! My fiancee and I are extremely happy with the site and would recommend to everyone. Absolutely perfect for our beach wedding! I have no complaints about my invitations. They have the perfect wording and goes well with out theme. The quality was well matched with the cost. I couldn't have asked for anything better. I love these invitations! They are so cute. Everyone was very impressed with them. The paper quality is great - better than I was expecting. I also loved that there was a lot of space to write your own "message" on them. Since we are getting married in the DR on the beach, these are great. The only thing that I would have liked to see were designs available for the envelopes (something beachy). I chose not to get lined envelopes as I didn't think they were worth the extra cost. my starfish beach wedding invitations. Very easy to customize, great quality, quick delivery. I almost gave up on finding the perfect 25th wedding anniversary (renewal of vows) invitation. After pouring over hundreds of examples, I found Invitations by Dawn website, typed in a few key words, and up popped this amazing invitation. We are holding the ceremony in Jamaica and wanted a beach theme. I added my own personalization script, fonts, envelopes, etc., and had the invitations in 5 days, they are amazing and all of my invited guests have commented on how much they loved it. You just can't go wrong, it was easy, professional and cost effective. This invitation was special, special enough to create our 25th anniversary theme that fit us and our destination to a T. Thank you! I love these Starfish invitations!!! I was looking thru multiple sites, and these were the most original and inspiring. It put a huge smile on our guests faces!!! I ordered a digital proof of the product: our wedding invitations, reply postcards, and thank you cards, which I'm glad I did and recommend doing, because the font was hard to read with the color I chose. I had some concern about the paper quality considering the proof was digital, however, the card stock was excellent and came out exactly as I had imagined. The corrections were prompt, as was the delivery.All in all, I have to say, I had a wonderful experience! I was really happy with the outcome of these invites. I got the photo finish and was impressed. Not only that but they shipped the same day I ordered them, and got them a few days later regardless of the 4th of July holiday. Also was stoked you could personalize the lines on the invite. I will recommend invitations by dawn to all my friends! Absolutely perfect for my wedding. Wedding Invitation. Great paper. Great sparkle effect. Perfect for my occasion. Adorable cards, I ordered them in the pearly shimmery paper and they came out great. I used them for my destination wedding in the Dominican Republic. Absolutely cute and good quality. The accomodation card was printed on non shimmery paper. I dont know if I didnt specify the shimmery paper or not so I was dissappointed to see it didnt sparkle like the RSVP card and Invite card. Also get the sticker encloser for the envelope. Very nice touch. The invitations that we ordered were perfect! The color is beautiful and the shimmer paper added a nice touch. We were unhappy with the color of the lined envelopes that we chose, and this wonderful company shipped out a new batch of envelopes in a different color right away. They didn't even wait for me to return the first batch.....you don't get that kind of customer service anymore! The invitations came just days after we ordered them. I cannot say enough about Invitations by Dawn. Prompt shipping, good quality, fair price and super customer service! I actually received phone calls and text messages when the invitations were received by my guests, telling me how much they loved them! They are gorgeous! The post card (response card) was very unique and earned many compliments as well! love these!!! fantastic invites and matched our theme perfectly! we have gotten tons of compliments on these! fast shipping! I used these for our Wedding Reception and people loved the design. Everything was as promised on the website. The personalized invitations were perfect! I was nervous when the sample we received had evidence of paper feeding rollers, but I was beaming when I opened our shipment to see our flawless wedding invitations! I had considered doing the invites myself with an invitation kit from a retailer but there is NO way they would've turned out this good & it would've cost more $$$! So glad my fianc� talked me into lightening my load & ordering the invites preprinted!!! Paper quality and print were top notch! I do wish we could've ordered them in multiple of 20 though (75 was too few, 100 left us with 24 extras - but at least I have one for our wedding album now!). I used these starfish invitations for my destination wedding invitations. I instantly fell in love with the design and bright, beachy colors. I had trouble designing the invitation because there was little space to write the details. I wish there had been more flexibility with this. I ended up having to print my own insert to fit everything because I couldn't fit it on the invitation or the reception card (which had even less space to work with). Lastly, the font was a little smaller than I wanted once I received them in the mail. But overall, I love them and have received a TON of compliments from my guests! Back of the card was blank. Limited refund policy for unsatisfactory product. I bought wedding invitations from Invitations by Dawn. They were perfect and better then anything I could have imagined. I was leery at first since this was ordering online, but they were perfect and better then I could have imagined! We used these as our wedding invitations for our destination beach wedding. They were perfect. With only 30 days to plan a wedding, getting the invitations within one week was WONDERFUL!!! love these , highly recommend them! Amazing amazing! Couldn't of asked for anything better for my wedding! I am having a beach themed wedding and theses starfish invites hit the spot! I had ordered a free sample and I wasn't surprised when my full order came out great! I would buy it again. I was very impressed. I will shop again. I order these invitations for my wedding. The quality was just what I expected. I would recommend this site to friends and family. Just the right touch for our beach wedding theme. Used these for reception invites, everyone loved them and they were quick and exactly what we wanted. We purchased these wedding invites for our beach wedding. I fell in love as soon as I opened the box. Couldn't be more happy with our order. Great quality, great size invite, and simply beautiful. Simple and sweet. Def a great deal. They also arrived way ahead of scheduled delivery date which was a super plus. I would recommend these absolutely perfect. These invitations are so beautiful!! I also got the rsvp postcards with the same design and they are so cute! They are simple but elegant and will go great with your beach theme. the only thing is that I couldn't personalize it that much and couldn't put my website in them because it said was to long and the space was limited and if you reduce the font it will tell you that it's to small for people to read. At the end we decide not to put the website and that's it. Overall they are well worth the money. I would highly recommended this website, especially if you need invitations fast! Very cute and good price. The custonization is awesome however, the response cards are coming back ripped up from going through the post office's machine. This is so bad at time we can not read who responded. Fun invitations for destination wedding with a casual reception to follow back at home. Easy to personalize and order. Extremely quick turnaround time. Flawless and error free printing. I would recommend Invitations by Dawn to anyone. Everyone loves these invites. Very timely delivery and great quality. Great, beautiful invites. They were perfect because I was able to make it the way I wanted. I love them. I just wished the paper was a little nicer, like maybe a little glossy. They would be awesome if they were. I ordered wedding invitations with envelopes for a very short-notice wedding. The invitations caught my eye because they were very unique, they fit the ocean theme of our wedding very nicely, and the pre-selected wording was perfect to describe the occasion. I had to change the time for the event after sending the invitations to print and the sales associate I called was very helpful, made the changes and sent me proofs before the order officially went to print. The order printed and shipped quickly, and since sending out the invitations I have received many compliments on the quality and uniqueness of the invitations.My only cons with my order are 1- Invitations can only be ordered in multiples of 25, so I have many extras, and 2- additional personalizations were available, but not cost-effective. Overall, I am very pleased with my order and excited to show my invitations to people. Thank you for the high-quality craftsmanship and printing! I ordered these invitations for my wedding (as well as the response cards, reception cards, and thank-you notes) and they are absolutely stunning. Very good quality paper and printing, really cute design. They look exactly like they do online, if not better! I recommend matching your font accent color to the color of your inside envelope...really made for a spectacular contrast with the blue! Everyone loved them! Fit perfectly with our theme! These are perfect for our Wedding Day ,because the theme is the beach, and Starfish on th beach are great! My daughter got married in Costa Rica, we wanted to have just a reception for her and her new husband in the states. I didn't want to buy invitations off the rack at a drug store and have to write all the information. This worked perfectly, I was able to personalize it to include all the information. They look great! The cards are beautiful and the theme fits perfectly. I appreciate the variety of card options that were available. While there were a lot of personalization options, the examples of how to make changes were a bit hard to understand, and not user friendly. The invitations are amazing! I am beyond satisfied with them. The starfish invitations said what I needed them to say "DESTINATION WEDDING!" They are super cute and very high quality! The image is beautiful in person and the design and wording I chose came together beautifully! I chose PEARL inner envelope which matched well with the beach theme since it's actually quite SANDY looking. I am 100% satisfied and I would recommend these designs to anyone planning a destination wedding! I was very happy with this site. 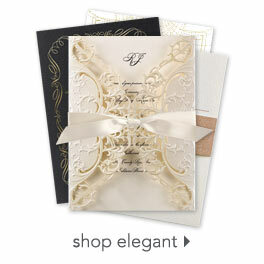 There are many options so that the invitations can be formal, informal, or anywhere in between. I am not a wordsmith, so it was nice to have many options to bring out the "atmosphere" we wanted. I love these cards and received many compliments on them. Im very happy and relieved that these cards turned out so good! Loved these invitations for my destination wedding! Great quality! Used for my wedding invites, rsvp and thank you. They came out really nice and the cardstock was really thick, which I liked. I liked the ability to personalize my cards. I love my invitations ! The order was filled quickly. I received them the same week I first looked at it on line. I liked that I could customize it to exactly what I wanted to say. The price was also great! These invitations are really cute. The paper quality is good. The envelopes are pretty cheap and the back of the invitation is a plain white. The printing on the front of the invitations is really nice. I bought these for my destination wedding and they are absolutely perfect! I will absolutely purchase more from this site! Looking for a wedding invitation to fit the venue and a less formal design was a challenge until I found your website. The finished product more than met my expectation. My only suggestion would be that for this particular invitation, it would be nice if the scene or colors were continued on back instead of a plain white back. Customer service was very helpful, but it was difficult to place the order on line without calling. We are overjoyed and will definately recommend you to friends, family,work assoc. looking for invitations. Thank you for helping with the vision for our special day. Invitations by Dawn is a fantastic company. We were able to find the PERFECT wedding invitations that fit 'us' as a couple. Perfect, beyond measure. I loved everything about these products. I would definitely use this company again for future needs. THey do beautiful work, they have fantastic suggestions on wording for your various needs, and have options where you can even further personalize your items by creating your own wording, in addition to all your personal info you put on your cards. I love that there were matching RSVP cards AND matching THank you notes! I did like the offer of extra envelopes, even though I did not purchase any. I learned why people might need extra envelopes. LOL One small, minor suggestion: I'm completely new and not knowledgeable on wedding invitations or any invitations that are more involved. Luckily, my future mother in law was here and was able to explain the process. If you guys were able, maybe a short list of possible instructions? RSVP cards and invitation go in INNER envelope with Names of invited guests on the inner envelope and then all is stuffed in the outer envelope (name side of inner envelope facing the open of outer envelope, and outer envelope is addressed and stamped and sent out. I knew that the RSVP cards need to be addressed to us and stamped before putting it in the envelope, but any other beginners might not know that so a little note about that could be helpful too. Thank you so much for all of your work and your precise product information, including many ways to personalize, and additional options for purchase! I cannot thank you enough. THey are just perfect for us. These invitation were perfect for our destination wedding. I was just a little disappointed with the lining of the inside envelopes... We chose silver for the lining inside, but when we received them, they appeared to be a shiny dark gray. Otherwise, we absolutely loved the design of the invitations, and so did the recipients!